Plasma thyroglobulin and neck ultrasound allow the detection of residual or recurrent disease in the majority of post-operative differentiated thyroid cancer patients. The two tests are complimentary to each other and are better than either test alone. Neck ultrasound is superior to neck palpation and allows morphological differentiation of benign from suspicious cervical lymph nodes. A baseline neck ultrasound is performed at 3-6 months post-operatively to examine the neck for persistent thyroid cancer and to plan for radioactive iodine ablation in patients at an increased risk for thyroid cancer recurrence. Neck ultrasonography is repeated periodically thereafter to exclude recurrent disease. 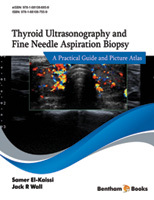 Suspicious cervical lymph nodes and thyroid bed lesions can be biopsied under ultrasound guidance, and a needle washout obtained for measurement of thyroglobulin in patients with differentiated thyroid cancer and calcitonin in medullary thyroid cancer. Neck ultrasound also allows the examination of other anterior neck structures such as muscle and blood vessels for invasive disease and can be used to mark the location of suspicious nodes pre- or intraoperatively. In patients with elevated plasma tumour markers and negative neck ultrasound, whole body iodine scan or cross-sectional imaging may be useful.